Been two months since I updated this space. I solely blame it on the pre-occupation to some prior commitments. Excursion to Dandeli Wildlife Sanctuary and Gokarn from 1st November to 6th November 2008. 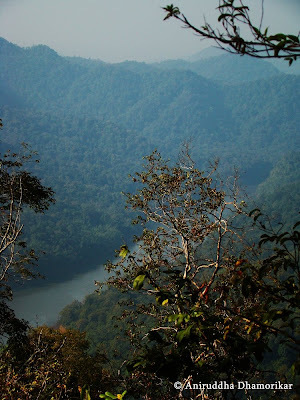 Dandeli panorama from Kawala Caves with Kali River in view Introduction The visit to Dandeli WLS was proved fruitful in all ways – thanks to our tour operator. The time of the year was excellent and so was my luck with the fauna around. Although I am a layman when it comes to flora, it was in a bloom everywhere. To expect the unexpected, a sloth bear and a wild elephant was on my wish-list, but no dreams came true. None the less, I saw some large and very small varieties of other life forms that one ought to glance upon down under!